Learn more about Living God's Abundance in the Arkansas-Oklahoma Synod! Here are a few items that may assist you. Please feel free to make copies and share within your congregation. If you have any questions about the resources available, please contact your congregational Key Leader. 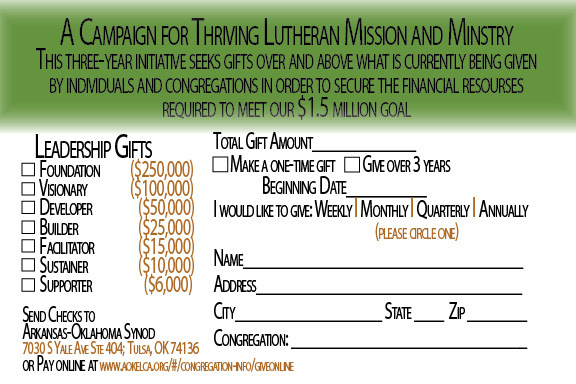 To support the Living God's Abundance campaign, you may mail a check to the synod office or pay online here. Please feel free to make copies and share within your congregation. NEW video! Click here to see a great video by Pastor Liz!